1. Mix 0.2 ml of the reagent with 0.020 ml of the protein solution. 2. Read absorbance at 595 nm. Standard clear 96-well plates or cuvettes can be used for absorbance reading. 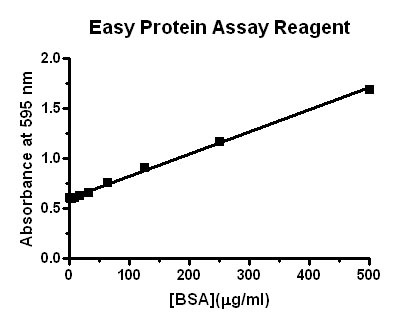 The reagent is sufficient for 2500 assays (0.2 ml / assay using micro plate) or 500 assays (1 ml / assay using 1 ml-cuvette).